Motorola flagships have barely launched as we get leaks about a new Moto flagship. The Motorola Bounce is mentioned to be shatterproof. Motorola just updated their Moto lineup with X Style, X Play and G and we already have new leaks. Upleaks has posted the rendered image above to Twitter with possible specifications. The new device is called Bounce for now, we don’t know if it is the final name. Bounce will pack a 5.43″ QHD 1440p display, Snapdragon 810 SoC, 3GB of RAM and 32 or 64GB of storage. 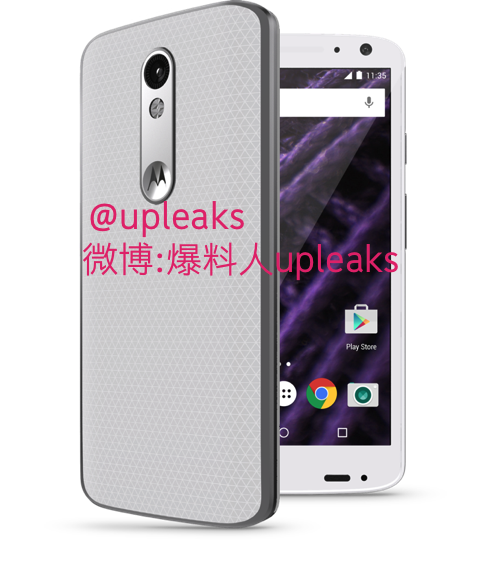 Battery is going to be huge like in the Moto X Play, 3760mAh. Cameras are going to be the same found in X Style and in X Play, 21 and 5MP. Possibly the most interesting feature Upleaks mentioned in the Twitter post is the shatterproof design. The name Bounce and the image would also suggest that the device would have some rubber around it to prevent damage. Still the most fragile part is the display so we are interested to see what the Bounce has to offer to protect its screen. According to Upleaks, the Motorola Bounce will launch in December. With its features it’ll compete with Samsung’s Active models and Sony’s waterproof flagships. It’s not competing with the more jewelry like iPhones or Samsungs.